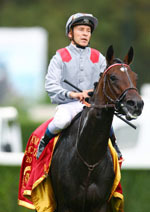 Before the 2014 Qatar Prix de l’Arc de Triomphe, no thoroughbred had managed to successfully defend the Arc crown since Alleged in 1978, and no filly had scored back-to-back victories in the Great Race since Corrida in 1937. It had already come as a bit of surprise that Criquette Head’s super-mare was going to stay in training in 2014 following her first awesome five-length Arc win almost 2 years ago. Even more astonishing, for many observers, was the way she so convincingly bagged her second Arc last October, in view of all the setbacks she had undergone in training (see “Trêve’s outstanding comeback”)! The result? Trêve slammed the opposition by 4 lengths on her reappearance and is now heading for the Grand Prix de Saint-Cloud (Gr 1) on June 28th, the next stopover on the road in her bid for an historic third Arc win.